Dr. Patrick Brunner, the author of today’s guest post, is Instructor in Clinical Investigation at The Rockefeller University. On July 26 2016, a group of young physician-scientists from The Rockefeller University visited the Drs. Barry and Bobbi Coller Rare Book Reading Room at the New York Academy of Medicine. As part of the Clinical Scholars curriculum, led by Dr. Barry Coller and Dr. Sarah Schlesinger, these researchers regularly meet for educational tutorials, and the excursion to the Rare Book Room has clearly been one of the highlights of this past semester. Arlene Shaner, the curator of this exceptional collection, presented seminal works to the group, and her deep insight and passion for the history of medicine made the excursion a unique experience. Ms. Shaner started the tour with the presentation of one of the most outstanding works of Western medicine – Andreas Vesalius’ opus magnum “De humani corporis fabrica libri septem” (On the fabric of the human body in seven books) from 1543. Ms. Shaner comprehensively and clearly outlined the historical context in which this book had been published, and fascinated her audience with a display of the book’s iconic woodprints. This artwork, which everyone in the room had seen in numerous reproductions, now laid open in its original form – showing the famous muscle man posing in front of an Italian landscape, and the skeleton, leaning on a spade, gazing towards the sky. 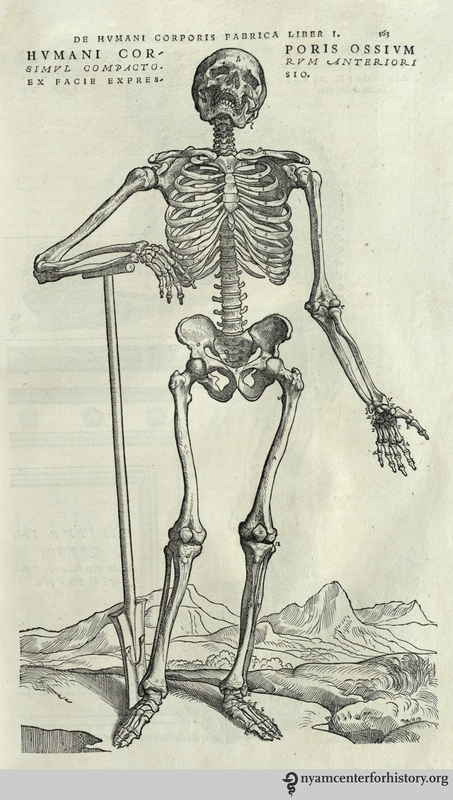 Skeleton from the 1543 Fabrica. Click to enlarge. A letter, sent from Oxford, dated July 7th, 1909, had been incorporated into the book as an inscription. From this letter one can learn that Sir William Osler himself donated the book to the New York Academy of Medicine. Ms. Shaner clearly knows each and every inch of this version of Vesalius work, one of three copies that the New York Academy of Medicine holds. Inscription by Sir William Osler found in our 1543 Fabrica. Click to enlarge. Vesalius’ Fabrica has undoubtedly been one of the most influential books on human anatomy, overthrowing the observations and influences of the Greek physician Galen, which had been uncontested by Western medical science for more than 1300 years. And it was not until 1628 that another seminal work, which had also been put on display for the evening, William Harvey’s treatise “Exercitatio anatomica de motu cordis et sanguinis in animalibus” (On the motion of the heart and blood in animals), established that blood circulates in a closed system, and that the heart acts as a pump – a manuscript considered by many scholars to be the single most important publication in the history of physiology. The visitors from The Rockefeller University were greatly impressed by the richness of this library – especially as they learned that all the books are available for review through the library’s archives, be it the “Anatomia hepatis” (The anatomy of the liver) by Francis Glisson, or the first atlas of skin diseases by the dermatological founding father Ferdinand von Hebra. Arlene Shaner also presented Bernhard Siegfried Albinus’ “Tabulae sceleti et musculorum corporis humani” (Tables of the skeleton and muscles of the human body), first published in Leiden in 1747, which not only depicts anatomical studies in a monumental fashion, but presents the models within elaborate and artful surroundings – overall, an impressive testimonial of its time. The climax of the visit was the display of a very special gift donated to the New York Academy by Sir Alexander Fleming – a capsule containing a colony of Penicillium, taken from the original culture that produced one of the world’s first antibiotics for medical use. And it has only been about 70 years since this medication became available! 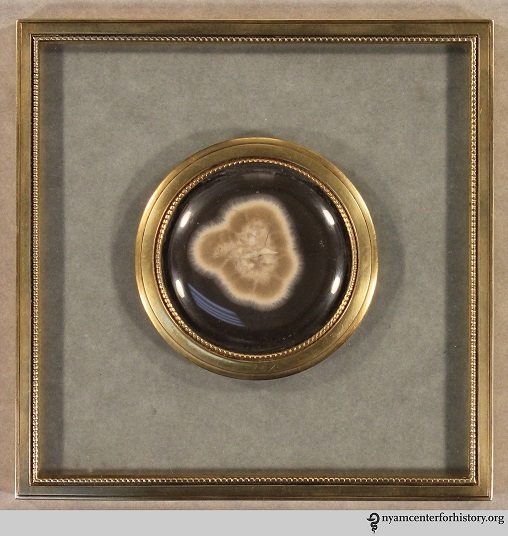 Capsule containing a colony of Penicillium, donated by Sir Alexander Fleming. Click to enlarge. Seeing all these treasures that irreversibly changed the world, and learning about the stories behind them in the context of both medical and art history, was a unique, and almost sensual, learning experience for the visitors, and Ms. Shaner’s never-ending expertise helped everyone in the room to deeply dive into history. Aldous Huxley once said: “The charm of history and its enigmatic lesson consist in the fact that, from age to age, nothing changes and yet everything is completely different.” Understanding the challenges that these authors face during their life times, which may not have been quite so different from the ones that we face today, while, at the same time witnessing the dramatic changes that have been instigated by their works, was a true inspiration. The afternoon passed quickly, and everyone agreed that they wanted to come back and further explore this treasury in the middle of New York City. This entry was posted in Collections, History of medicine and tagged Alexander Fleming, Andreas Vesalius, Bernhard Siegfried Albinus, guest post, William Osler by nyamhistofmed. Bookmark the permalink.